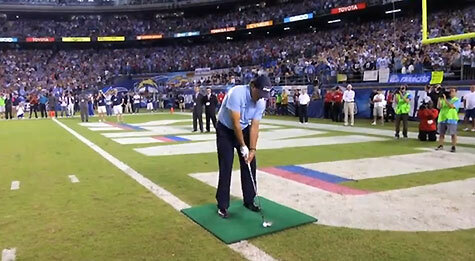 I was excited to watch Phil Mickelson hit a 100 yard shot from goal line to goal line at last night’s Monday Night Football game, during half time. Unfortunately ESPN did not cover any part of the shot. I heard ESPN had Phil on the pregame and he broke down and analyzed the two teams very well. I wonder if he predicted that Denver and Peyton Manning would execute one of the largest road comebacks in NFL history, coming back from a 24-0 deficit to win by double digits?